Protein is an essential building block of human life that plays a crucial role in cell growth. Amino acids are the building blocks of protein, and some nutritional companies market amino acid or protein supplements to individuals who want to maintain or increase muscle mass. A branched chain amino acid, or BCAA, is an amino acid group that has noncontinuous, or branched, links of carbon bonds. There are 20 amino acids that your body needs to function properly. You can divide these into essential amino acids, which you must consume in your diet because your body cannot synthesize them, and non-essential amino acids, which your body can synthesize from other nutrients. The three BCAAs — isoleucine, leucine and valine — are all essential amino acids. While BCAA supplements may contain one or all three of these, protein powders such as whey or casein contain all of the BCAAs, as well as the remaining seven essential amino acids. BCAAs and the remaining essential amino acids in protein powders serve a similar supplemental purpose: the preservation and potential growth of muscle tissue. Leucine is particularly important to muscle growth, according to College of New Jersey sports nutrition researcher Jay Hoffman, Ph.D. Your muscles readily convert leucine into energy during exercise, which prevents the breakdown of muscle tissue. While BCAAs are the most crucial amino acids for muscle development, the World Health Organization emphasizes that you need to consume all of the essential amino acids in your diet to maintain proper nitrogen balance in your body. Leucine is one of the main amino acids that triggers muscle protein synthesis in your body, but so is the essential amino acid glutamine. 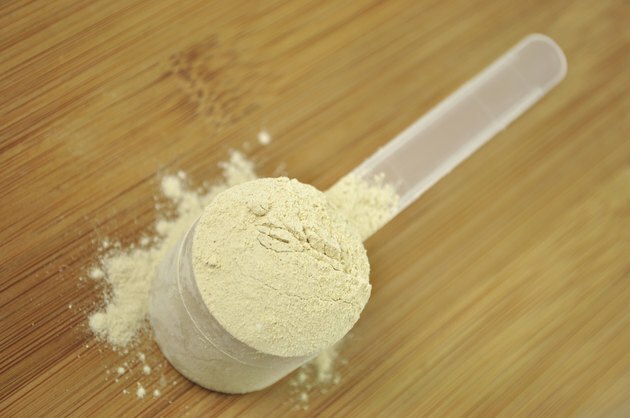 Consuming a protein powder that has both glutamine and leucine may promote greater muscle protein synthesis than consuming a supplement lacking one of them. For example, whey protein powder has high levels of all of the essential amino acids, including the BCAAs, and it performs better as a muscle growth supplement than a protein powder like casein, which has less leucine. Always speak to a registered dietitian before consuming an amino acid or a protein supplement so you can know exactly how much of the supplement you need. As a general rule, sedentary adults need around 0.8 g of protein per kilogram of body weight per day, while strength and conditioning athletes may need as much as 1.7 g for the same body weight. If some of your protein comes from powder supplements, ensure that the supplement you use has all of the essential amino acids. American Council on Exercise sports nutritionist Fabio Comana states that if you are supplementing with BCAAs, a common recommendation is a ratio of two parts leucine to one part isoleucine and one part valine. The RDA value for BCAAs is 14 mg per kilogram of bodyweight for leucine and 10 mg for the other two. Huntington College of Health Sciences; A Primer On Branched Chain Amino Acids; Starkie Sowers, C.N. American Council on Exercise; The Latest Scoop: Current Supplement Research Overview; Fabio Comana, M.A., M.S.